Argas is a trainer at the Bavelock gym. 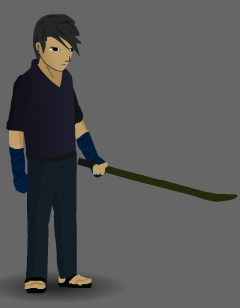 He is a swordmaster who teaches you some tricks in the beginning of the game. You can always visit him and ask for a training session. Sparring with Argas deals no damage both ways, and will still increase your stats. You either fight him in battle for free to increase your stats over time, or you pay him for a quick training in whatever skill you want to increase. Argas has a small part in the sidequest "Helping Jaden", where Brock wants you to show Argas his sword Climhazzard. You simply hit him one time in battle with the sword.